Many people have locked themselves out of something. Many times it is a locker at school or work, perhaps a garage or shed with a deadbolt on it. In some cases, it is more urgent, like locking yourself out of a car you need to get to work, or even worse, your house. If you get locked out of your home, there are several steps you can take to get back in without shattering a window. The first thing to do is not to panic. Panicking only makes you more anxious and prone to bad decision making. Instead, take a deep breath and try to remember where you left the keys. Sometimes you think you are locked out, but you are not. If you have a spare key hidden somewhere, like under a rock or potted plant, retrieve that and get on with your day. You will also want to check to see if any other doors or windows are open. Perhaps you are locked out of the front door, but there is a back one or even a garage door that may be unlocked that you can use to get access to the inside of your house. If there is no key anywhere on the property and no unlocked doors or windows, then call someone who might have one. A spouse, partner, or child may have a key that they can bring over. If you are a renter rather than the owner, then the landlord or landlady most likely has a key somewhere that they may be willing to bring over. Many movies and TV have shown people trying to get back into a locked door with the use of a credit card. This may help in some cases and is definitely worth a try. It doesn’t have to be a credit card, any thick, flexible card will do. In fact, it is better not to use a credit card in case it snaps in half. Should none of these be options, there are more ways to try and regain access. For example, if you have a screwdriver present, you may be able to unscrew the doorknob and get through the door. Of course, there may not be any visible screws to use, but this is an option for those that do have visible screws. Don’t forget to check other doors for visible screws as well. If you don’t have a tool, see if a neighbor is home and ask to borrow one. 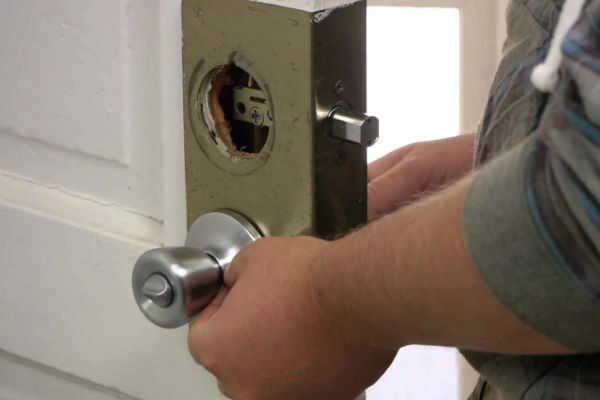 A locksmith is always an option if you have no other recourse. They can usually be there in a short amount of time and can let you back in. While they are there, you may want to inquire about ways to avoid a lockout for the next time. They likely have lots of ideas, such as using a keyless entry method. This would entail you using either a code or even a thumbprint in really advanced systems. This way, you are never locked out and don’t have to worry about physical keys. Just in case it happens again, make sure that you leave a key with a trustworthy neighbor or family member, or hide one somewhere on your property. This way, you do not have to waste minutes or even hours waiting for a solution.